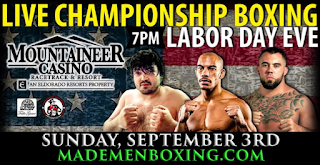 This upcoming Sunday, September 3rd Made Men Promotions will bring professional boxing to the Mountaineer Casino Resort in New Cumberland, West Virginia. Headlining card will be unbeaten super middleweight Joey Holt (7-0) of East Liverpool. Holt, 32, who also fights MMA will take on 32-year-old Josh Fisher of Columbus. Fisher, who has won 3 out of his last 4 bouts, will bring a 4-3 record into the Labor Day eve match. Co-headlining the card will be a championship match for the WBC FECARBOX Super Middleweight Title as Bobby Gunn Jr. takes on Mike Miranda. Gunn Jr., 20, is the son of legendary US bare-knuckled boxer Bobby Gunn and will carry a 7-0 record into the bout, his first in over a year. While Gunn Jr. might have youth on his side, his opponent will bring a wealth of experience. Miranda, 44, has also been inactive for over a year but is no stranger to activity in the ring as the Brazilian brings a 44-6 into the ring. Also slated to be in action is super welterweight Montana Love, one of Cleveland's top young prospects. Love, 22, is 6-0 since turning pro in 2015. There will be plenty more bouts on tap for this card which will be held in the Casino Ballroom is slated to begin at 7:00 PM with the doors opening at 5:00 PM. Ticket information can be found here at the Made Men Boxing Promotions website.